The turbine engine data acquisition system Model AE-31-DAQ for PT6A turboprop engine is a real time data capturing system. The complete system includes engine-mounted sensors, signal conditioning circuits, data acquisition hardware, and the customized software that captures several engine parameters in real time by sampling data once every second. The captured data is stored in a PC at a user-defined location. There is no limit on the size of the captured data file. Therefore, the data pertaining to the entire duration of engine run can be stored. The stored data can be played back at exactly the same pace as the data was captured. 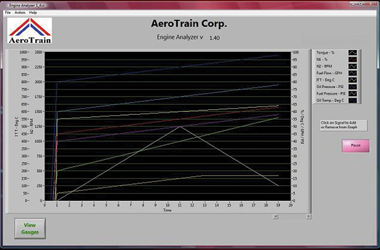 This is a very useful feature for the instructors and the students because the parameter variations during engine operation can be viewed and discussed as many times as needed. During engine operation, the instructor and students are supposed to use ear muffs, and hence it is not possible for the instructor to provide detailed explanation during the engine run-up due to high noise. The data acquisition system provides a convenient and effective method of explaining engine operation by data playback in a quiet classroom setting. There is a cost benefit associated with the use of data acquisition system. The PT6A run-up requires jet fuel which costs money, and frequent runs will require more frequent engine maintenance and parts replacement. By using data acquisition system, the duration and frequency of engine operation may be reduced without compromising on the educational benefits of a runnable engine stand. All of the above parameters are also plotted in the form of graphs superimposed on the same time scale. This allows the instructor to explain inter-dependence of various variables. An on-screen control provides toggling between instrument display and the graphical display. The graph screen allows the user to select which parameters should be visible in a plot, to de-clutter the graphs as desired. The captured data is displayed on electronic gauges, and a digital readout is also displayed, showing the unit of measurement. 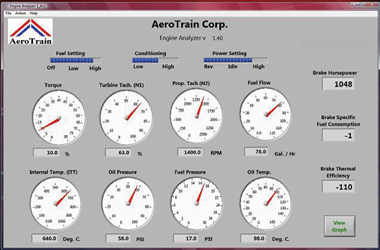 The displayed data is refreshed every second, providing almost instantaneous response when engine’s operating conditions are changed. Copyright © 2019 AeroTrain Corp. All Rights Reserved.